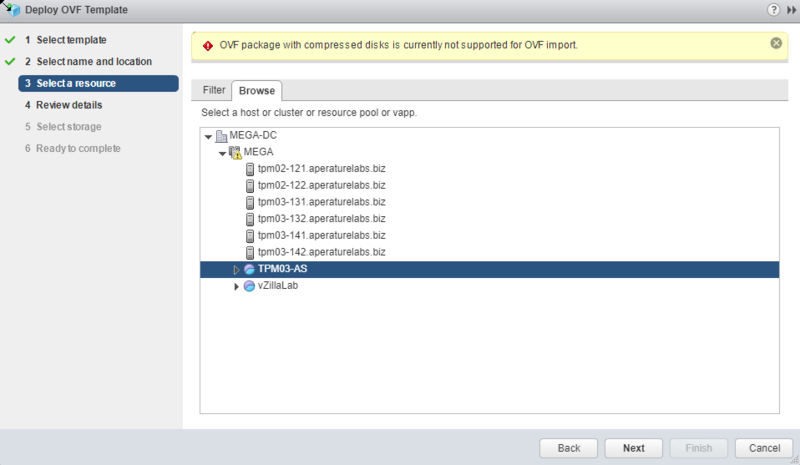 Quick Fix: OVF package with compressed disks is currently not supported - VIRTUALIZATION IS LIFE! A couple of weeks ago I ran into an issue stopping me from importing an OVA and today I came across another issue relating to the Web Client not able to import OVF packages with compressed disks. There seems to be a lot of issues to do with OVF/A operations in vSphere 6.5 Update 1…in fact there are 187 mentioned of OVF and 95 mentions of OVA in the release notes. Searching through the release notes I found a specific entry relating to this issue that I came across and it’s work around. The workaround is to download OVFTool and run a simple command to convert the OVF or OVA template to one without the compressed file…which in effect its just a copy of the original. Seems like a strange fix but it works!